Earlier this fall, an international team, led by researchers at MIT’s Haystack Observatory measured the radius of a black hole at the center of a distant galaxy — the closest distance at which matter can approach before being irretrievably pulled into a black hole, which can be billions of times more massive than our sun may reside at the heart of most galaxies. Such supermassive black holes are so powerful that activity at their boundaries can ripple throughout their host galaxies. At the edge of a black hole, the gravitational force is so strong that it pulls in everything from its surroundings. However, not everything can cross the event horizon to squeeze into a black hole. The result is a “cosmic traffic jam” in which gas and dust build up, creating a flat pancake of matter known as an accretion disk. This disk of matter orbits the black hole at nearly the speed of light, feeding the black hole a steady diet of superheated material. Over time, this disk can cause the black hole to spin in the same direction as the orbiting material. Caught up in this spiraling flow are magnetic fields, which accelerate hot material along powerful beams above the accretion disk The resulting high-speed jet, launched by the black hole and the disk, shoots out across the galaxy, extending for hundreds of thousands of light-years. 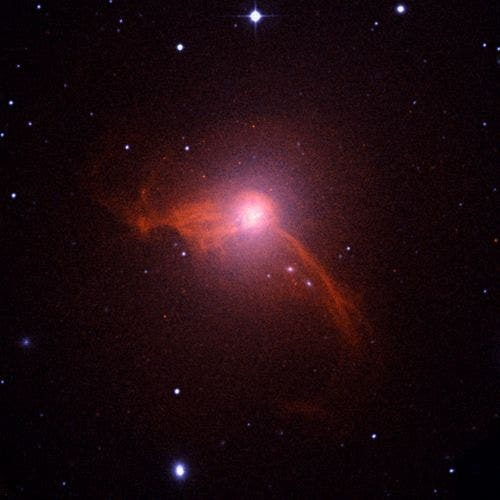 These jets can influence many galactic processes, including how fast stars form. A jet’s trajectory may help scientists understand the dynamics of black holes in the region where their gravity is the dominant force. Doeleman says such an extreme environment is perfect for confirming Einstein’s theory of general relativity — today’s definitive description of gravitation. 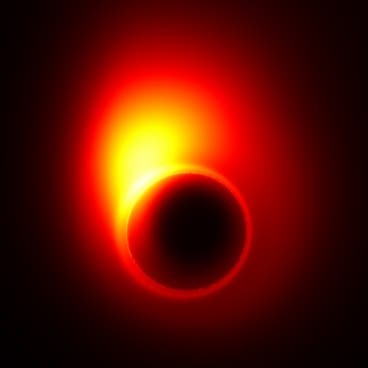 The image above, created using computer models, shows how the extreme gravity of the black hole in M87 distorts the appearance of the jet near the event horizon. Part of the radiation from the jet is bent by gravity into a ring that is known as the ‘shadow’ of the black hole. “Einstein’s theories have been verified in low-gravitational field cases, like on Earth or in the solar system,” Doeleman says. “But they have not been verified precisely in the only place in the universe where Einstein’s theories might break down — which is right at the edge of a black hole." According to Einstein’s theory, a black hole’s mass and its spin determine how closely material can orbit before becoming unstable and falling in toward the event horizon. Because M87’s jet is magnetically launched from this smallest orbit, astronomers can estimate the black hole’s spin through careful measurement of the jet’s size as it leaves the black hole. The team used a technique called Very Long Baseline Interferometry, or VLBI, which links data from radio dishes located thousands of miles apart. Signals from the various dishes, taken together, create a “virtual telescope” with the resolving power of a single telescope as big as the space between the disparate dishes. The technique enables scientists to view extremely precise details in faraway galaxies. Using the technique, Doeleman and his team measured the innermost orbit of the accretion disk to be only 5.5 times the size of the black hole event horizon. 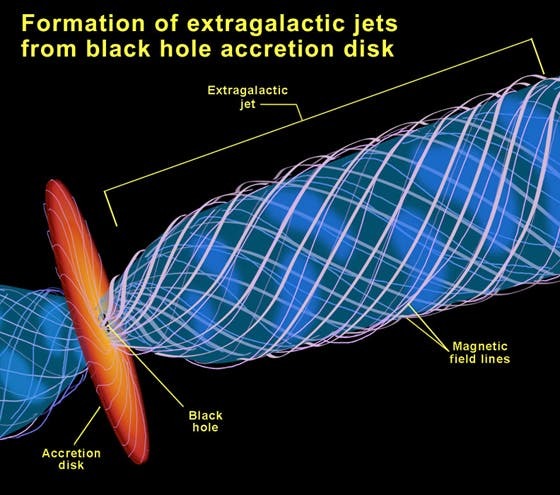 According to the laws of physics, this size suggests that the accretion disk is spinning in the same direction as the black hole — the first direct observation to confirm theories of how black holes power jets from the centers of galaxies. The team plans to expand its telescope array, adding radio dishes in Chile, Europe, Mexico, Greenland and Antarctica, in order to obtain even more detailed pictures of black holes in the future. The image below, from the jet is bent by gravity into a ring that is known as the ‘shadow’ of the black hole. Monster Elliptical Galaxy Discovered –Ten Times Diameter of Milky Way! Andromeda's Supermassive Black Hole: "Mystery of the Rings of Ancient Red and New Blue Stars"